I heard that the fish monger was selling a greenish fish that was caught from Angat Dam. It turned out to be Large-Mouth Bass - a fish popular in the USA. How it got to Angat Dam...who knows? I was curious how Aklay would deal with it. We never cooked fish before. Core the tomatoes and score the bottom with a cross shape. Line them up on a baking pan, bottom side up. Dab oil on top of tomatoes and sprinkle with salt, pepper and spices. 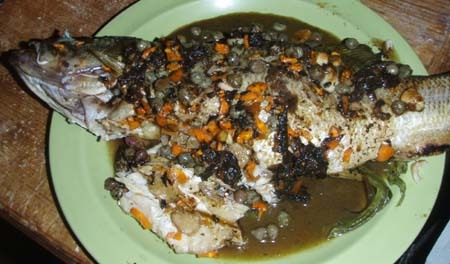 Combine a small portion of the minced veggies (onions, garlic, carrot, ginger), the parsley bunch and stuff it inside the fish. 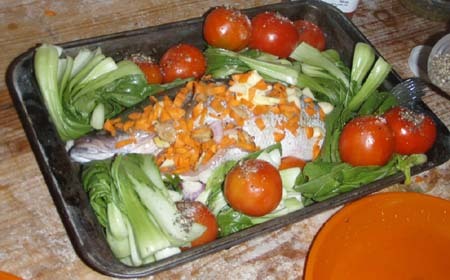 Rub salt and pepper on fish, and put it in the middle of the baking pan. 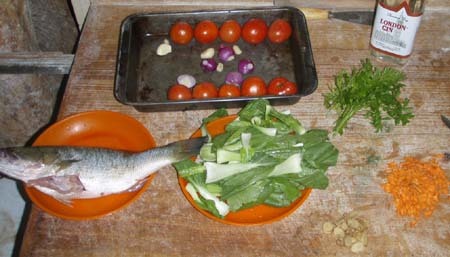 Fold the pechay and squeeze it in between the fish and tomotoes. Sprinkle the rest of the chopped veggies on top of the fish. In a very hot oven, put the pan at the lowest level. When the oil 'sings', transfer the pan to the upper level. Total time for the lower and high level is 20 minutes. 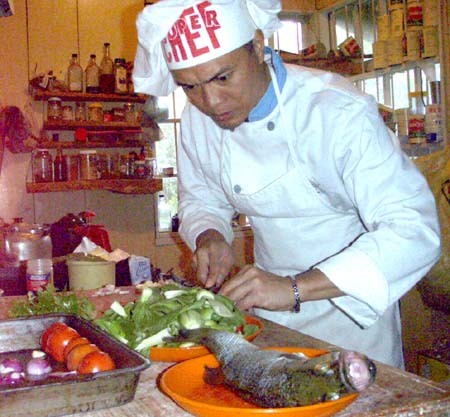 Remove the fish and place on serving plate. 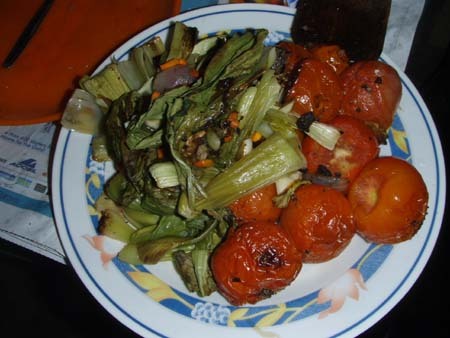 Remove the tomatoes and pechay and place in separate serving plate. What should be left on the tray are the pan juices and the minced veggies. Put the pan on medium heat, melt butter and pour the lemon juice into the pan and toss in the capers. 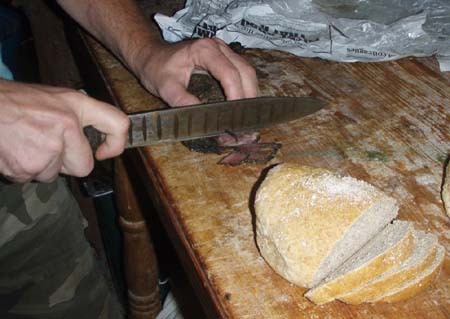 Scrub with wooden spatula to make sure they all mix together - that's the sauce. Pour the sauce over the fish and serve. It would have been perfect except for a little problem. With the small talk going on between Aklay, myself and Janet, Aklay thought he already put the pan at the upper level. When the 20 minutes was up and we took the pan out, we realized the fish was on the lower level the whole time. 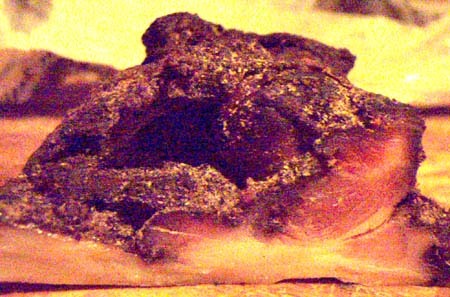 You guessed it...the fish was overcooked, but not burned. Nonetheless, the dish still came out ok. Complemented by Aklay's home-smoked wild pig and fresh baked whole wheat bread, it was a feast.